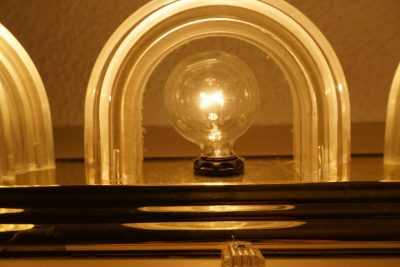 Although LED light bulbs have been around for a while, I have not been able to totally replace all my lights in the house to LED ones until quite recently. The main reason is that some of my existing light fixtures only take G16.5 style bulbs with E12 screws and higher wattage LED bulbs of this kind only became available until quite recently. Here are a couple of pictures showing the original incandescent G16.5 bulb and the new EcoSmart 60W dimmable LED bulb I replaced with. 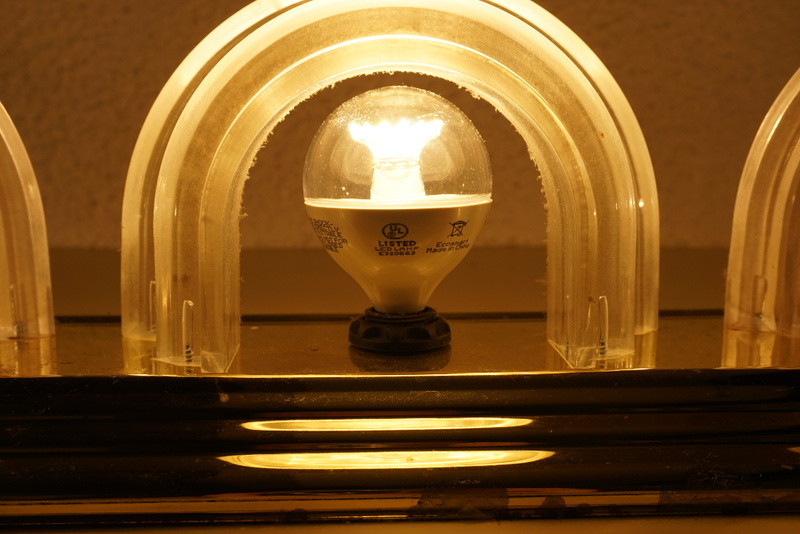 The LED version of the G16.5 bulb is a tad taller than the incandescent one and just fits the light fixture I have. 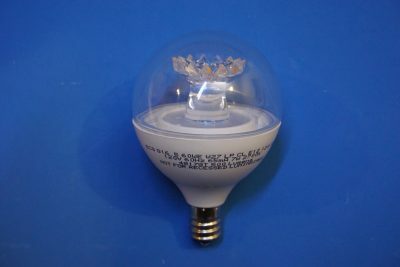 This EcoSmart LED bulb is rated at 7W (60W equivalent of an incandescent bulb) and comes with a plastic dome which can be easily removed by squeezing on the tabs along the edge. 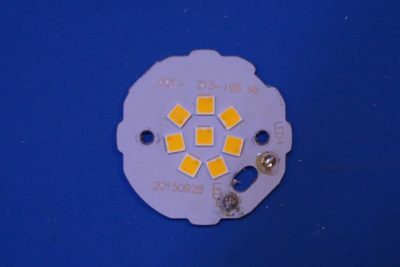 There are eight LEDs connected in series and during normal operation the voltage drop across all eight LEDs is at just below 50V (presumably there are two LEDs in series in each LED chip assuming each white LED drops around 3V). 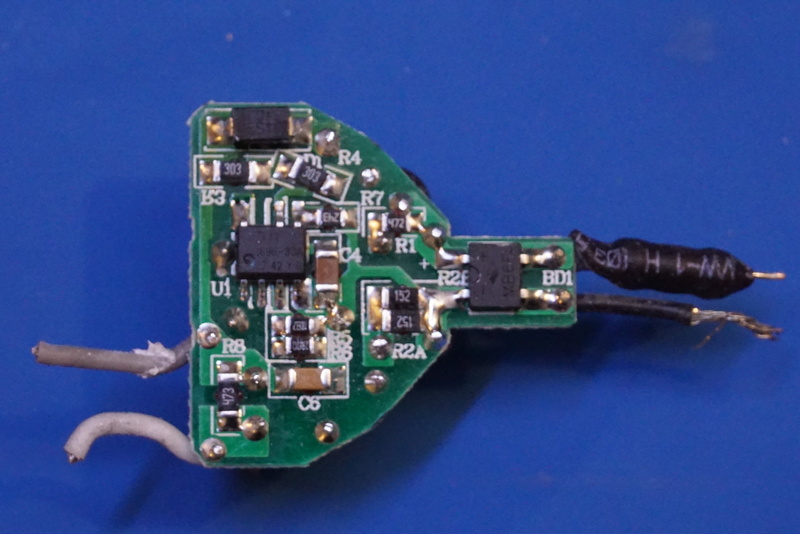 The current through each LED would be slightly less than 140mA at the rated 7W. This light bulb uses an AL1696-30A offline LED driver which offers good power factor (measured at around 0.75). 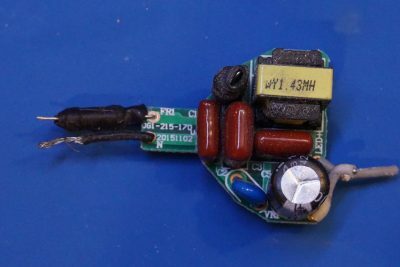 Since the driving MOSFETs are builtin, only a few external components are needed and thus the entire circuitry can be crammed onto a tiny circuit board that fits into the G16.5 bulb base.